#ThemeSongTuesday: Heeeeeeeeeere's Tyler! - Smark Henry | The voice of Filipino wrestling fans | Philippine Wrestling Revolution, WWE, and more #ThemeSongTuesday: Heeeeeeeeeere's Tyler! Over the last couple of years, writing this column has given me a newfound appreciation for the theme songs that don't initially stand out when you hear them on TV. Giving the song a full listen with my headphones on really helps in getting over my initial impressions of the tracks. I liken it to the experience of opening a booster pack of Pokémon cards—you don't know what goodies you'll end up finding! One of those goodies is Tyler Bate's WWE entrance theme, which is a low-key treat. Before we get right down to it, how about you listen to it in full right here? Let's get this out of the way: "Inaugural" is a typical CFO$ loop. But this loop establishes the type of impression you want to have of Tyler Bate. From the moment the drums kick in and the beat drops, you get a happy, upbeat theme, which makes you want to smile and bop along. I can get over the synth horns in the track because the guitar licks are slick enough to keep me hooked. The drumbeat itself doesn't seem too complicated and accomplishes its job of maintaining the energy for a cheerful entrance. It's very fitting, given that Tyler Bate himself always comes out looking like he's in a great mood. In the words of Brandon Beal, this dude is ready to smile and wave, smile and wave. What's fun about this song is that it also sounds like the theme of a 90's game show. I can imagine a montage of highlights from the show playing to "Inaugural" as it ushers in the opening credits. 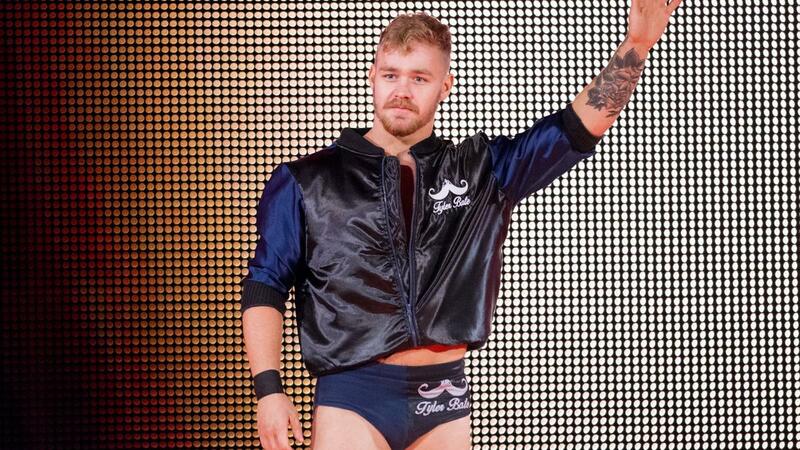 The feel-good vibe certainly helps establish Tyler Bate as an all-around great guy. Here's someone who's smiling from ear to ear, someone you shouldn't be afraid of, and someone you should totally get behind. I don't even think it takes away from Bate's badassery and deceptive strength. A good entrance theme establishes the type of character just on the musicality alone and "Inaugural" achieves that. This theme song won't make it to my gym playlist because it doesn't necessarily inspire me to lift heavier or get intense. But if I need a song to get me in a good mood, I wouldn't mind playing this at all. Like I said, low-key goodie. Are there any new entrance themes you want featured on this space? Drop your requests (like a radio listener would) below in the comments section!